Presence of excessive algae is not only irritating but can also affect TSS, pH in lagoons, clarification and UV disinfection. We provide a variety of environmentally safe solutions for algae removal. Foams can occur due to seasonal changes, hydraulic flow, or a shock to your treatment plant. Learn how our line of defoamers can address your biological and surfactant induced foam. We provide solutions for industrial and municipal wastewater treatment optimization. Bioaugmentation and knowledge of biological wastewater processes have been and remain our specialty since 1980. Our team of representatives addresses clients concerns with on-site evaluations and full technical support. So many blends to choose from–grease bugs, plant startup, shock recovery, digester, denitrification, nitrification. Learn more about what blend is right for your application. We offer on-site visits to to your plant to answer questions, discuss your particular needs, and offer solutions. Visit our service page to learn more or contact us to schedule a visit. Let’s be honest, wastewater stinks. Excessive odors can cause more than neighbors to complain, H2S can cause corrosion. We provide chemical and biological solutions for eliminating odors. Achieving complete mixing of lagoon thermoclines can be costly and difficult to maintain. Solar power mixers can reduce BOD, TSS, ammonia, sludge build up and improve pond efficiency. Presence of excessive algae can affect TSS, pH in lagoons, clarification and UV disinfection. 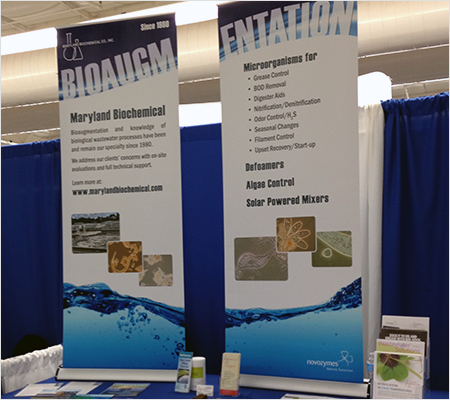 Maryland Biochemical provides a variety of environmentally safe solutions for algae removal. Foams can occur due to seasonal changes, hydraulic flow, or a shock to your treatment plant. We provide a variety of solutions for biological and surfactant induced foam. With permits getting more stringent on ammonia limits. Our blend of Nitrosomonas and Nitrobacter can help keep your plant within permits and worry-free! Plants can experience problems with settling. The abundance of filamentous bacteria can cause bulking solids. We provide technical service to find a solution.